The expression ‘Paese che vai, usanza che trovi’ is often spouted by Italians, as wise advice or an admonishment, I’m never sure which. The well-known English equivalent, ‘When in Rome, do as the Romans do’, means exactly the same thing and is the golden rule for all travellers to foreign lands. Tourists in Rome however, can take this saying literally, especially when it comes to food. I’ll eat like a Roman any day. Non sto male, that’s for sure. Some of the Roman meatless classics you are likely to find include spaghetti alle vongole verace, carciofi alla giudia, insalata di puntarella and my favourite Roman dish of all time, Spaghetti Cacio e Pepe. A bowl of cacio e pepe: the creamy Pecorino sauce hides within. I’ve had a few attempts at reproducing an autentico Spaghetti (or Tonnarelli) Cacio e Pepe over the years with varying success. The dish has only three ingredients yet is not so simple to make. There are a few magic techniques to master for a perfect result. After trawling through a variety of Italian sites, I’ve settled on the advice offered by the Giallo Zafferano site ( beware the advertisement bombardment on this site ). Many non-Italian sites add such things as butter or oil which ruin a good Cacio e Pepe. Don’t be misled by these recipes. When making this cheesy peppery dish, keep in mind that the sauce will use the hot, starchy pasta cooking water. By gradually adding a small amount of this hot liquid to the grated cheese, a thick, non grainy sauce will form. The other trick is to toast the ground peppercorns in a large deep sided frying pan followed by added pasta water. This will make a starchy, peppery bath to finish cooking the semi- cooked pasta. When the pasta is added, it will absorb the extra liquid, a method similar to making risotto. It’s a good idea to read the details below a few times before beginning. If confusing, refer to the Giallo Zafferano site and watch the video demonstration of the creaming method. Ingredients. For two large serves for a main meal. sea salt for pasta water. Tools. Pasta pot, deep sided large frying pan or large non stick wok, small whisk, bowl, mortar and pestle, tongs, wooden spoon. Yes, only three ingredients and a whole lot of tools. Boil the water in a pasta pot (use about half the usual amount of water to cook the pasta so it will be richer in starch) and salt well. When the water comes to a rolling boil, add the pasta. Timing is crucial here. If your pasta usually takes 10 minutes to cook al dente, set the timer for 8 minutes. You want the pasta to be slightly under cooked at this point. Meanwhile crush the peppercorns with a mortar and pestle or grinder. Pour half the ground pepper into a large frying pan or non stick wok and dry roast over low heat, stirring with a wooden spoon or tongs. Add a couple of ladles of pasta cooking water to the peppercorn pan. Bubbles should appear due to the starch contained in the water. Using tongs, lift the semi- cooked spaghetti into the frying pan, keeping aside the pot of cooking water. Stir the pasta about, using a wooden spoon or tongs. When the water is absorbed, add another ladle of pasta water and continue stirring. Continue adding a ladle of pasta water as needed. In the meantime, when you think the pasta is almost ready – and this can only be judged by tasting along the way – prepare the Pecorino cream. Pour half the grated Pecorino into a small mixing bowl. Add a few tablespoons of pasta cooking water and mix well with a whisk. When it is creamy, add more Pecorino and a little more cooking water, whisking all the while. Keep going in this way, holding back a little grated cheese for the final condiment. Finish cooking the pasta, adding a little more cooking water if necessary, before adding the Pecorino cream. Briefly mix the cream by placing the bowl over the steam of the pasta pot hot water, and stir with the whisk. This brings the cream back to the temperature of the pasta. Turn off the heat and add the Pecorino cream, stirring continuously with the kitchen tongs until well amalgamated. Serve adding more grated cheese and a little extra pepper. Mangia! Chef on break. Roman laneways and trattorie. Do as the Romans do, eat Cacio e Pepe autentico. This month I have returned to breads made with yeast, particularly those from one of my favourite reads, The Italian Baker, by Carol Field. Carol Field journeyed through villages and homes throughout the Italian countryside to collect recipes. They were then published in her original volume in 1985. This classic was revised in 2011. Few photos or glossy styled food shots adorn this book. It is a pleasure to read even if you never bake from it. It is often assumed, because of its title and appealing photo of ciabatta on the front cover, that it deals solely with bead: in fact, there are numerous chapters on cakes, biscuits and pastry, some of the latter collected from Nonne in remote villages, recipes that are tinged with nostalgia e memorie. A traditional walnut cake made by the older folk in Viareggio, Toscana, Italia. A good egg enriched cheese bread is not a daily offering but a special treat to go with a creamy soup, a celery velouté, for example. I followed Field’s recipe for this, but decided to make dinner rolls and a little bâtard with the final dough. The recipe is simple and precise, but next time, I might use all the little odds and ends of leftover cheese residing in boxes in the fridge. The recipe includes details for making the bread by hand, by mixer and food processor. Each method is a little different. I am using a stand mixer, because I am lucky enough to have one: it gets a good workout every week and was a worthwhile investment. Pane al Formaggio– Cheese bread. I large egg white, beaten, for glazing. Stir the yeast into the water in a mixer bowl; let stand until creamy, about 10 minutes. Mix in the eggs and oil with the paddle, then the flour, salt and cheeses. Change to the dough hook and knead until firm, velvety and elastic, 3- 4 minutes. The texture may be slightly grainy from the cheeses. Place the dough in a lightly oiled bowl, cover with plastic wrap, and let rise until doubled, about 2 hours. Punch the dough down on a lightly floured surface and knead briefly. Cut the dough in half and shape each piece into a round loaf or batârd shape. Place on a baking sheet or peel sprinkled with cornmeal, cover with a towel and let rise until doubled, about 1 hour. six rolls and a batard, ready for the oven. Thirty minutes before baking, preheat the oven with a baking stone ( if you have one) to 220c. Just before baking, baste the loaves with the egg white. Slash the long loaves with three parallel cuts. Sprinkle the stone with cornmeal and slide the loaves onto it. Bake for 40 minutes, spraying the oven three tines with water in the first 10 minutes. Cool on a rack. The Italian Baker, revised. Carol Field, 2011. Ten Speed Press. Another contribution to Leah’s Cookbook Guru, who is highlighting The Italian Baker this month. 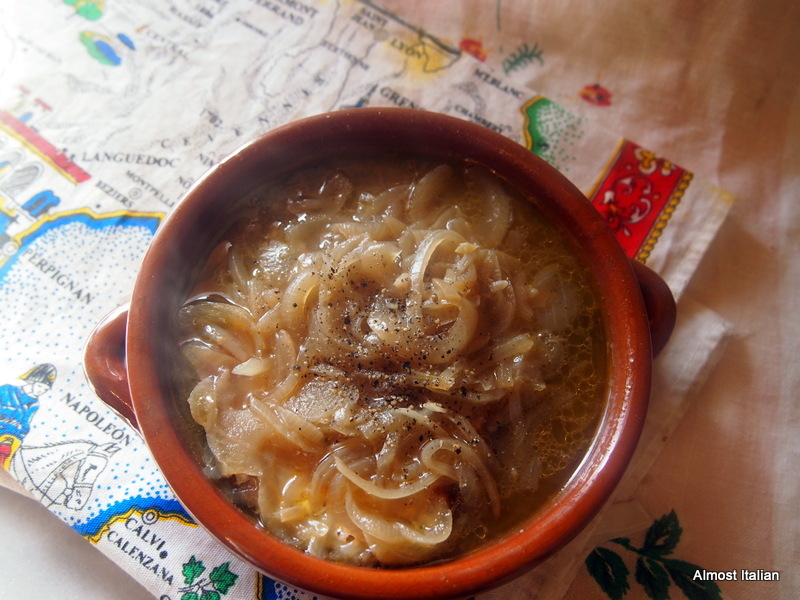 A big bag of onions hiding in a cold larder is a call to soup, especially a comforting one such as Soup a´l’Oignon. 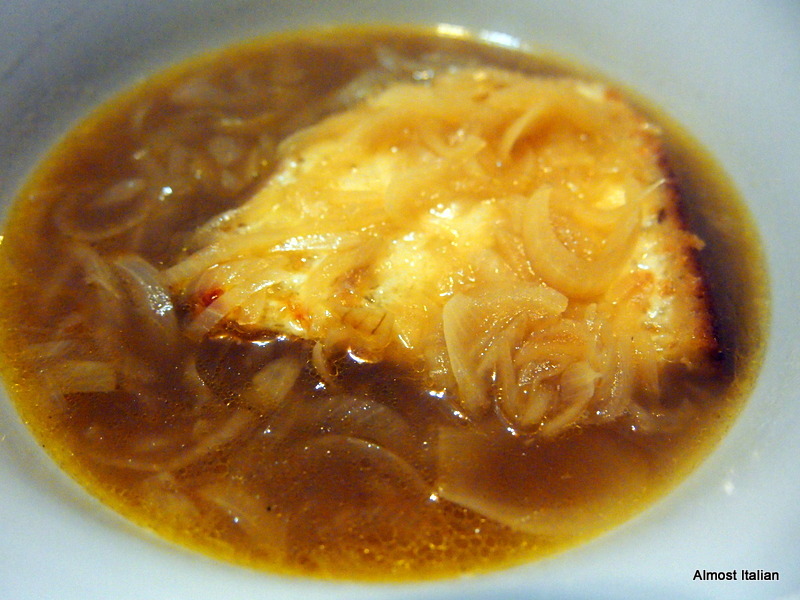 French onion soup became popular in the 1960s and although it may seem retro to some, I have never stopped making this classic soup. 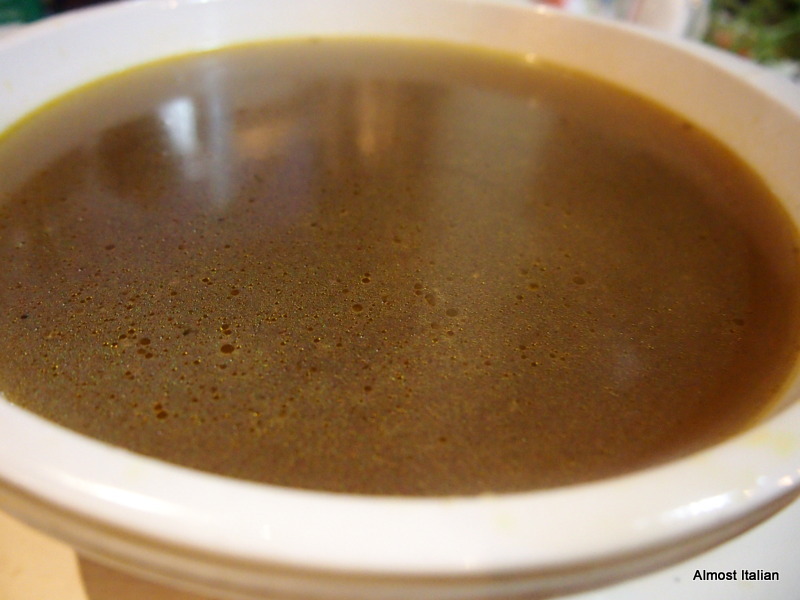 Every winter I tweak the stock and have now settled on a flavoursome brown vegetarian stock, a good substitute for the beef stock used in the original. 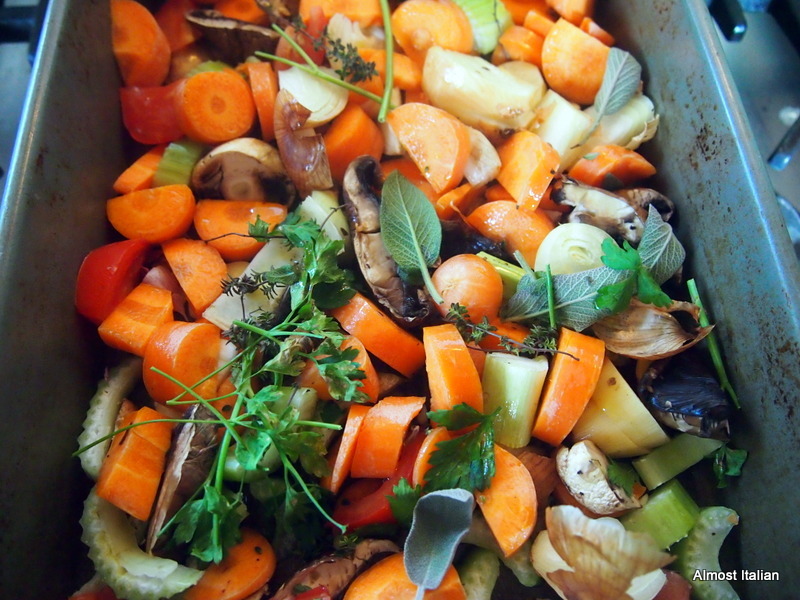 The key to a rich dark stock is to roast the vegetables first. Chop all the following vegetables into small chunks. Don’t peel the onions and the garlic. 5 or more large dark fleshed mushrooms. Toss the chopped vegetables and toss them in the oil. Don’t add the soy sauce yet. Bake in preheated oven to 180°c for 30 minutes or so, occasionally moving and tossing the vegetables around. When ready, remove them and place in a large stock pot, covering well with water, around 3 litres. Add the soy sauce. Bring to the bowl, reduce heat to low and cook for approx one hour. Strain into a bowl, pressing hard on the vegetables with the back of a large spoon to extract more flavour. You will need only 1.8 litres of stock for the onion soup so freeze the rest. Soupe a l’Oignon- for 6 servings. In a large heavy saucepan, melt the butter, add the oil and cook the onions slowly for at least 30 minutes, stirring occasionally. The onions need to colour a little but not brown. When done, sprinkle in the salt and flour. Stir over moderate heat for 3 minutes, remove from the heat and add the boiling stock. Add the wine. Season to taste. Simmer for 40 minutes. Correct seasoning. Just before serving, stir in brandy. Pour the soup over grilled bread and serve the cheese separately OR, after grilling or baking the bread, cover with the cheese, pop under a griller to melt, the place these in the base of each serving bowl, the cover with the hot soup. The toasts should rise to the top. The next day, just as good. This recipe came from my old Margaret Fulton Book, re-purchased in Savers for 99 cents. I have adjusted the original imperial measurements to metric, changed the stock to vegetarian, and abbreviated the making of the bread and cheese topping. 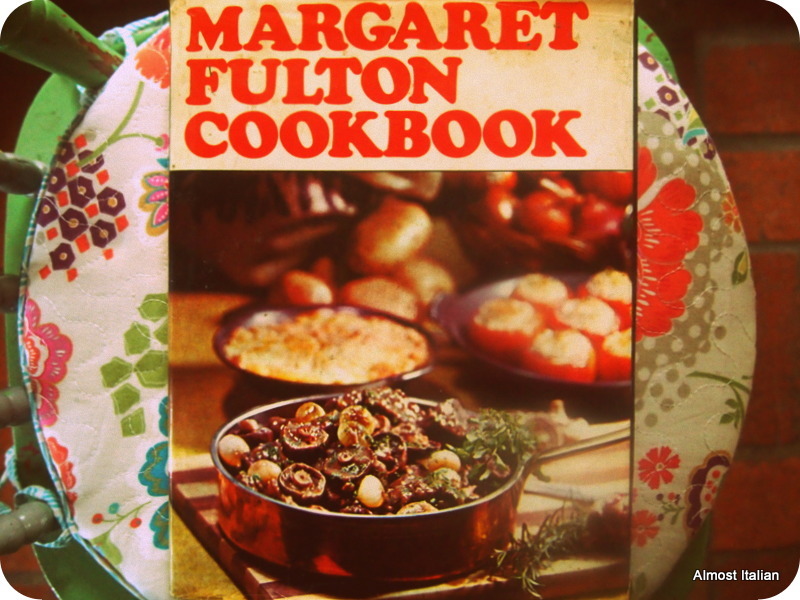 Margaret Fulton inspired many home cooks during the late 1960s and continues to do so today, with her simple but precise versions of classic recipes. At the time, many of the recipes seemed quite sophisticated. I still often refer to her version of Crème Caramel, Mushroom Soup and her cake recipes. Thanks Leah, for including one of our leading lights of Australian Cookery in your series, The Cookbook Guru.